Laying the foundation stone for the Royal Victoria Theatre on Manners St, Wellington, Alderman William Lyon welcomed the new amenity – ‘a theatre [was] a necessary concomitant of an advanced state of civilization.’ It was a morale-boosting event six weeks after the Wairau Affray (see 17 June) had shocked local settlers. The building was erected behind the Ship Hotel by its proprietor, John Fuller. It opened on 12 September with a double bill: Rover of the seas and Crossing the line, or the twin brothers. The Royal Victoria Theatre was a plain, rectangular wooden building, about 14 m by 9 m, with a gabled roof, a few windows along its side, and an entrance from the street next to the hotel. The interior had seating in stalls and a commodious gallery. It was brightly lit by whale oil gas, another innovation for Wellington. 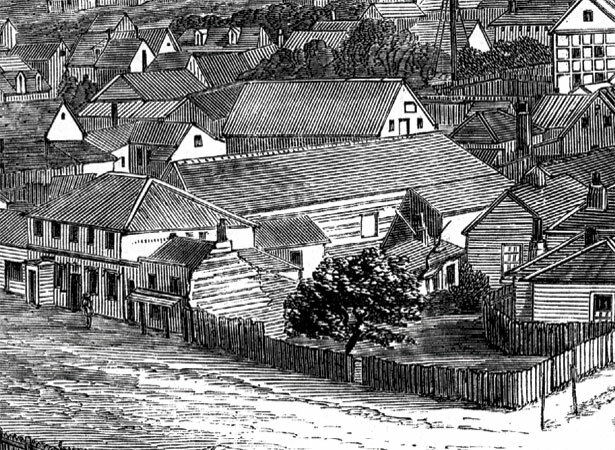 Auckland’s first purpose-built theatre was the Fitzroy, which opened in Shortland St in 1844. Wellington’s second theatre, the Britannia Saloon in Willis St, forced the Royal Victoria out of business soon after it opened in 1845. We have 4 biographies, 6 articles, related to Foundation stone laid for New Zealand's first purpose-built theatre .